If you are considering a getaway to Normandy France, this guide will highlight the best places to visit, where to stay and sights to see. Normandy is a very interesting area to explore....especially considering all of the history connected with WWII and the Normandy invasion. It makes a perfect short break from Paris....which is relatively close. Normandy Weather - The weather in this area is moderate with summers from 75-80 degrees F and winters barely going below freezing. I would avoid August when much of Europe is on holiday and weekends, also. Spring and Fall would be a great time for Normandy vacations. The first place that comes to mind when people think of Normandy France is often the World War II sites connected with D Day. The closest town to this area is Arromanches Normandy. This is a small, touristy town....a good place to stay if you really want to focus for a few days on the beaches of Normandy and D Day sites. There is a D Day Landing Museum with a 360 degree theatre, maps, momentos and videos describing the creation of Port Winston, the first prefab harbor. A stroll on the beach will reveal rusted remains and reminders of the famous Normandy invasion on June 6, 1944 when almost 1500 American, 2700 British and 500 Canadian soldiers died. Another great base for a Normandy France holiday is the lovely town of Bayeux. It is only 6 miles from the D Day Beaches. This majestic monastery, set on an island, is a "must see" on Normandy vacations. 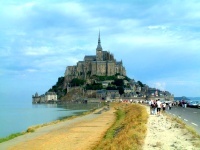 Check out my seperate page for Mont Saint Michel.